This weeks theme at Gothic Arches is “Friends”…our beautiful arch was made by this weeks hostess Jacqueline. A gorgeous combination of many design elements. What do you think of when “friends” comes to mind? Children playing? A dear old pal? A furry friend? We would love to see your creative arches here! Hi, I’m Jacqueline from France. My blog is Jacqueline’s Craft Nest and I love creating. Probably my preference is vintage and collage. I love arches too – this is the ideal size for me to create on. I am English born, married to a Dutch man and we live in the with our four boys, the eldest being 19, the youngest 13.We are missionaries, spreading the Word of God to the Francophone world, including the huge Continent of Africa! Making cards is my source of relaxation and I hope encouragement to others as I send and sell alot. I am so happy to have made so many friends via the blogs as I live in a very isolated area – so thanks to all you ladies who have encouraged me so much by visiting my blog! The arch theme I chose today is FRIENDS. 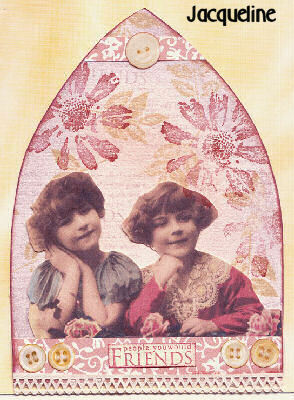 I used a distressed background and found an image which I love on a Tuscan Rose CD. Have fun creating! here is my friendship arch for this weeks challenge…. Hello Ladys, here is mine. Thanks for looking. Here is my contribution for this challenge – thanks for your ideas !!! Lovely theme again. Here is my arch. Wonderful, universal theme, Jacqueline. Thanks for the challenge. Thanks for such a great theme. This was fun!!! Ahhhh it felt good to create something!! Here’s my entry. Here’s my first attempt at an arch….Fun theme tho. Gorgeous arch by Jacqueline – very inspiring. Heres my arch for this weeks theme. Another great theme !!! Thanks for theses weekly challenges. Bonjour !! voici ma participation de cette semaine. I’m late, but here’s mine! Thanks Nancy, thanks Jacqueline! I feel frustrated not being able to leave a comment on certain blogs – they are the ‘over-blog’ type – I get a total shutdown on my computer if I go anyway near leaving a comment – sorry about that. Scrap-USA, your arch is simply a treat for the eyes, so I hope yo read this little message. Thanks for looking at my triple whammy. Hi! I’m spending Thanksgiving day making a little art. Thanks Jacqueline for a great theme ! It was for an arch “Man” but I think they are friends…. My “Friends” arch entry-thank you! Here is my entry thanks!